VW Golf Plus: first drive | What Car? Like an ageing film star with a face full of Botox, the 'new' Golf Plus is older than it seems at first glance. Volkswagen has given it angular headlights and a slim horizontal front grille, much like those on the latest Golf hatch, but it's actually more closely related to the previous-generation Golf. This means you have to put up with a fair bit of wind noise at speed and the Golf Plus rolls more than the hatch through bends due to its taller body. However, it still rides and handles well compared with most rivals. Volkswagen has also solved one of the old car's major weaknesses by binning its noisy diesel engines and replacing them with a much smoother 2.0-litre unit. Outputs of 108bhp and 138bhp are on offer and even the lower-powered version feels pretty gutsy. Alternatively, there's a pair of 1.4-litre petrols with 79bhp and 120bhp. Interior changes are limited to some new switchgear and a restyled steering wheel, but practicality remains the Golf Plus's main selling point. The rear seats slide back and forth on runners so you can change the balance between legroom and luggage space, while the high roofline makes life that bit easier when you're trying to strap in toddlers. Buyers can choose from two trims, with entry-level S models featuring air-conditioning, front and rear electric windows, six airbags and stability control. SE spec adds cruise control, alloy wheels and Volkswagen's Park Assist system, which steers the car into a parking space for you. 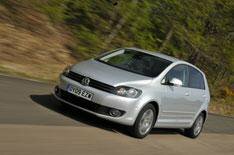 The Golf Plus comes well equipped, then, but it also costs between 245 and 1200 more than the equivalent Golf hatch. That seems quite a lot when Volkswagen hasn't bothered with major surgery.